All Natural and Homemade by Uncle Andy! 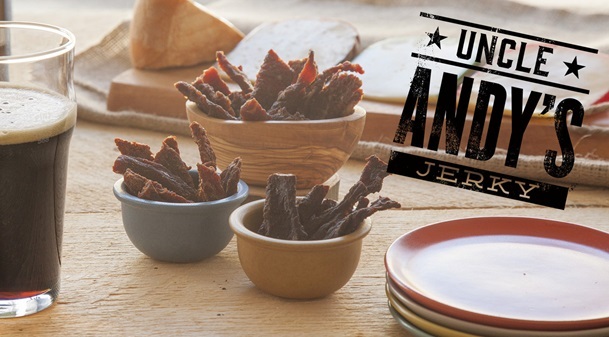 Uncle Andy's Jerky was born in the Fall of 2012 as the result of a credit given at the local hardware store. Never having been a fan of jerky, Andy used the store credit for a meat slicer and decided to try to make batch of his own. 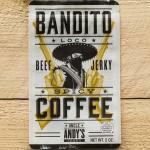 Combining his favorite aspects of different jerky’s to create the first 4 flavors. 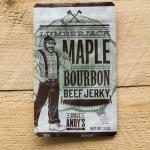 Inspired by the craft beer industry, Uncle Andy's Jerky continued to experiment and evolve, exploring the possibilities of what jerky can be. Through the journey Andy strove to become as educated as possible on the process and every ingredient used in jerky production. Not wanting to use ingredients strictly for marketing catchwords, He adopted the term “Honest Ingredients.” Choosing ingredients based on environmental impact, sustainability, accessibility and cost. Making the decision on what we are comfortable eating and sharing with our customers. Glazed with sweet maple bourbon and smoked over Hickory. 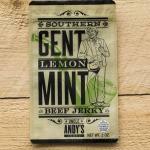 This is a delightful jerky with zest and natural lemon, a zing of salt and the tingle of cool mint. 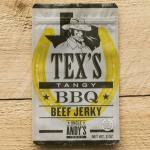 This delicious Jerky is smoked over Hickory and topped with that vinegary Tangy BBQ goodness. 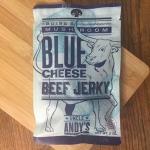 If you love the taste of Blue Cheese, you have got to try this jerky.